First Person Why do men have a problem with me - a fisherwoman? Why do men have a problem with me - a fisherwoman? “Does she actually like fishing?” That’s what the group of fishermen sitting beside us asks my father when I walk away from the table to get ready for a day out on the lake. I don’t hear the question. Lucky for them. But when my dad tells me about it later, I feel anger beneath my breastbone, even though I was kind of expecting it. This fishing lodge in Northern Ontario isn’t easy to get to: We drove eight hours to Cochrane, Ont., and then boarded a float plane for an hour-long flight north. We’re in the boreal forest, about 100 kilometres south of James Bay. If I didn’t actually like fishing, I’d be in trouble for the next seven days, not to mention out a few thousand dollars. Still, with my bright red hair, my long nails and my fluorescent turquoise jacket, I stand out among the majority male guests. The truth is, I do like fishing. I’m not the best at it, and I don’t always get the time for it, but when I do, I love being outside, at the mercy of the elements. I’ve fished in the rain – swathed in Gore-Tex and my glasses spattered with water. I’ve fished in water so choppy I’ve had to hold on to the gunwales for fear of barfing over the side of the boat. I’ve fished on beautiful days on which I’ve caught hundreds of walleye. I fish because I want to feel small in the face of the wilderness; I fish because I want to remove myself from the hustle and hardness of day-to-day life in a city. But mostly, I fish because I secretly want to catch a pike, like my father has and like so many fishermen before me have. My dad and I mainly spend our days fishing for walleye, because we can catch dozens an hour and it’s more fun to hit a frenzy than to spend hours casting and retrieving for one truculent fish that might not even be in the mood to take the lure. Still, I insist we do a little pike fishing. It’s good casting practice for me, and I want to learn the difference between spinnerbait and buzzbait, how to best use a Johnson Silver Minnow lure, how to quickly attach a leader to my line. 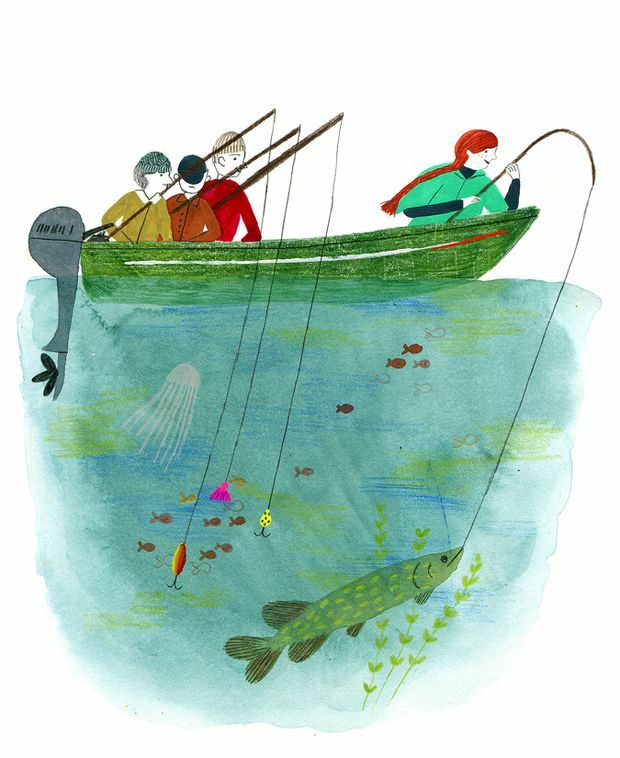 One afternoon, we find ourselves spending an hour nestled in a calm bay, casting into some aquatic vegetation in hopes of attracting a bite or two. It’s a perfect, warm afternoon: The surface of the lake is glassy and soft-looking, and our boat drifts in companionable silence. I cast my glittery gold buzzbait into a patch of weeds, squinting my eyes against the glint of sunlight, reeling it in at a pace that’s not too fast and not too slow. Suddenly, there’s a flurry of movement in the water, a thick, writhing splash. Before I have time to whip my head around and ask my father what’s happened, my line goes tight and heavy, and I know that what I just saw was a pike lunging for my lure. And now I have it on the line. It’s not a small fish either, judging from the way my rod is shaking. Tom, our guide, grins with a quiet excitement. “Fish on,” he says. Now begins the battle. That’s the thing about pike: they fight. I’ve watched my dad and Tom hook into them before; I’ve observed the dance. A pike will immediately start running, pulling out your line. The key is to let them tire themselves out, but also keep reeling, keep the line taut, because a loose line means a hook can slip out. Pike are cunning and crafty, I’ve seen them change direction mid-swim, zoom under a boat to try to snap a rod or even tangle the line in the motor to find a helpful sharp edge. My pike starts the run, hooking a hard right and taking my line around the back of the boat. Tom cuts the motor and he and my father watch, chanting advice. I can barely focus on what they’re saying, I’m so focused on the present, but my brain understands the commands: Don’t horse it. Don’t let your rod tip get too close to the water. Don’t loosen the line. Keep it tight. Keep reeling. When the fish goes under the boat, follow it; move around, get up on the seats, go from one side to the other. Baby it. Baby that pike right to you. I know I should be worried I’m going to screw this up, but instead, I’m laughing my head off. It’s like I’m on a roller coaster, strapped in for the ride, and all my anxieties are bubbling out of me in rich, joyful whoops. This is my fight. This is my chance to prove myself, to show that I belong here alongside these fishermen. And with that in the back of my mind, I baby my pretty pike to the cradle Tom is holding over the side of the boat. My father cheers as we measure my fish: 39 inches, a respectable size, though one inch shy of the size of the 40-incher that would really give me bragging rights. But I don’t care, not as I cup her muscular, slick head with my other hand curled around her tail. Not as I pose for a picture with her in which the two of us are open-mouthed and surprised. Not as I lower her back to the water, letting her reaerate her gills before she revives and slides off into the murk. Not as I quietly wipe tears from my eyes, as I hug my dad and high-five Tom, and send a silent thank you to the lake and my precious fish for letting me reel her in. That night, the group of fishermen sits down just as my father and I are finishing dinner. “Any big catches?” they ask. That’s when I turn with a grin. “Just a small one. Forty inches," I say, watching their faces change. My father smiles behind his wine glass at me stretching the truth, and when I walk away from the table, I resist punching the air in victory. Yeah, I think this woman actually likes fishing. She really does.